Disclaimer – This post contains affiliate links. That means if you purchase something through one of the ads I could receive a commission at no extra cost to you. Thank you for your support. It seems as though I have a fermenting theme going on in my posts lately and I am going to continue with that today. 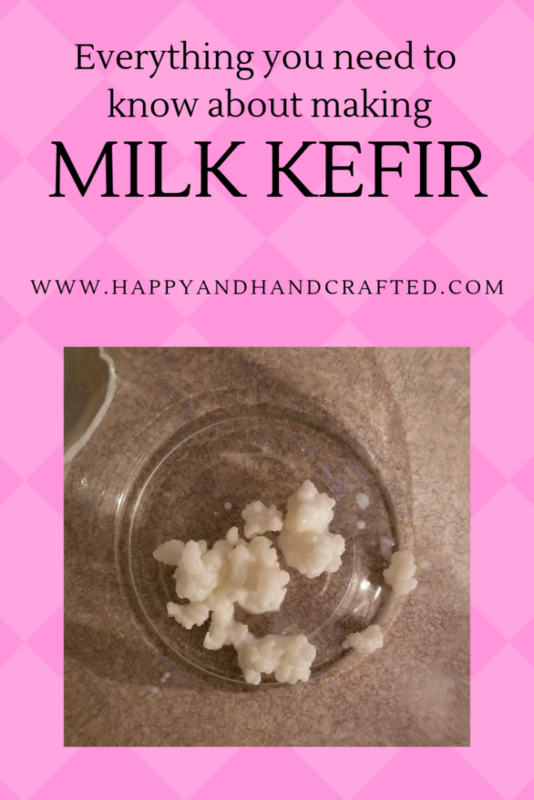 I’m going to be talking about milk kefir. This amazing drink originates from a grain that dates back two thousand years to the Caucasus Mountains of Europe. As far as I’ve read it’s unclear how the grains were started. 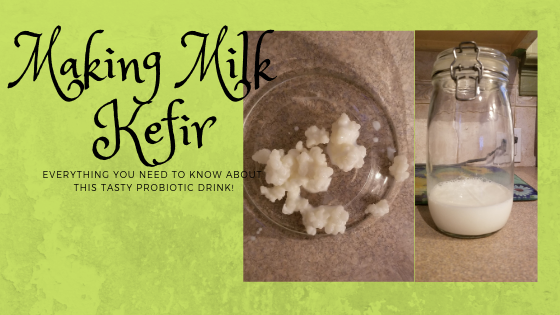 With many other forms of fermenting, when a “mother” is needed you can grow your own but that’s not the case with kefir. You absouletly have to get the grains from somewhere. The grains are alive and full of all those good bacteria that is so beneficial for good gut flora! They say all diseases begin in the gut and I believe that and am doing everything in my power to help mine out! These grains ferment milk. They feed on the lactose in the milk making this drink good for those with lactose allergies. They also multiply with each ferment, which is really neat because then you can make bigger and bigger batches or share them with your friends so they can have this wonderful drink too. That’s what Kefir grains look like. That’s all you need to get you started. Milk – I use homogenized milk. Almost any kind will work but the ones high in fat content seem to do better. Goats milk is fine too. Plant milk doesn’t really work however because it has no lactose for the grains to feed on. Most importantly you’ll need kefir grains. These can be acquired a few different ways. Check your local buy and sell pages, there may be someone close by who’s willing to share, Amazon has them as well (the link is below) I’ve even seen them at health food stores in the fridge section. This is probably the easiest ferment there is! Cover the grains with 1 cup milk and cover the jar. Use a coffee filter, paper towel secured with a rubber band or use a flip top jar with the seal removed. Leave it in a warm spot to ferment for the next 24 hours. When it’s done it should be thick and smell like plain yogurt. Simply strain it, put the grains back in the jar and add a 2 cups of milk this time. close the jar and let it sit the same as the first day. Now you can either drink it, use it in a smoothie or you can put it in a glass or jar with a few pieces of fruit set it out for a second ferment. Doing this makes even MORE of those healthy bacteria and it also gives it a bit less of that fermented taste. It never lasts long enough in my house for me to do this though. Haha. Almost any kind of milk will work but the ones high in fat content seem to do better. Goats milk is fine too. Plant milk doesn’t really work however because it has no lactose for the grains to feed on. I have read you can use plant milk to ferment once but then the next ferment needs to be with regular milk. I’ve never tried that so I don’t know if it will work. Depending on how you acquire your grains depends on how you’ll start. If you get them from a friend or locally You’ll likely need to strain them and wash them a bit. If you got them through the mail they will probably be dry. All you have to do is add them to a jar and cover them with 1 cup of milk and let it sit for 24 hours. You don’t have to wash the jar with each ferment. Some people rarely wash it at all. Personally I wash it about every third ferment. There is also some debate on whether you should rinse of your grains after each use. Personally I don’t unless they have been in the fridge on a break. That’s up to you though. If you get your Kefir grains dry I wouldn’t suggest using the first ferment. Just strain them, throw out the milk and set the grains to start again. When you’re first starting it’s better to add too much milk than too little. If you add too little then the grains can starve 🙁 If you add too much you simply have to let it sit longer so the grains can finish eating all the lactose. As with all fermenting stick with glass and plastic utensils and containers. Metals can hurt the grains. High-quality stainless steel is okay. If you want to take a break from it or you want to go on holidays just put it in the fridge. It can last for a couple of weeks like that. When you want to start again just strain, discard the milk, wash the grains and cover with milk. That’s really all there is to it. 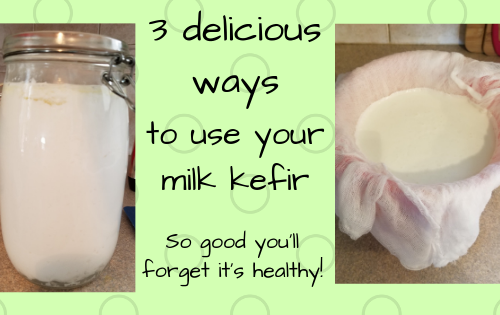 Just keep straining and remaking every day or every other day depending on how warm it is and how strong your grains are and you’ll have plenty of Kefir always! This is so cool! I love making things myself and definitely have to try this! It is pretty cool lol. I have fun making it!